Friday July 17th 1925 weather delightful. Wrote Hattie. Visited with the girls. Rested most of afternoon. Evening on the porch. Saturday July 18th 1925 Laura went to Peoria. I was here all day. Had letter from Millie Byington and Mrs Lowe. I wrote to Millie. We sent the evening on the porch. Wrote to Ida in AM. Sunday July 19th 1925 Edith went to S S and I had a taxi take me to church. I rested in afternoon. The Clarkes called late in PM. We spent the evening on the porch. weather pleasant. Monday July 20th 1925 Edith did washing. I read and did some other things. Rested in afternoon. After supper Mr Albers came to take us to the cemetery. Then to Browns for a ride and call. 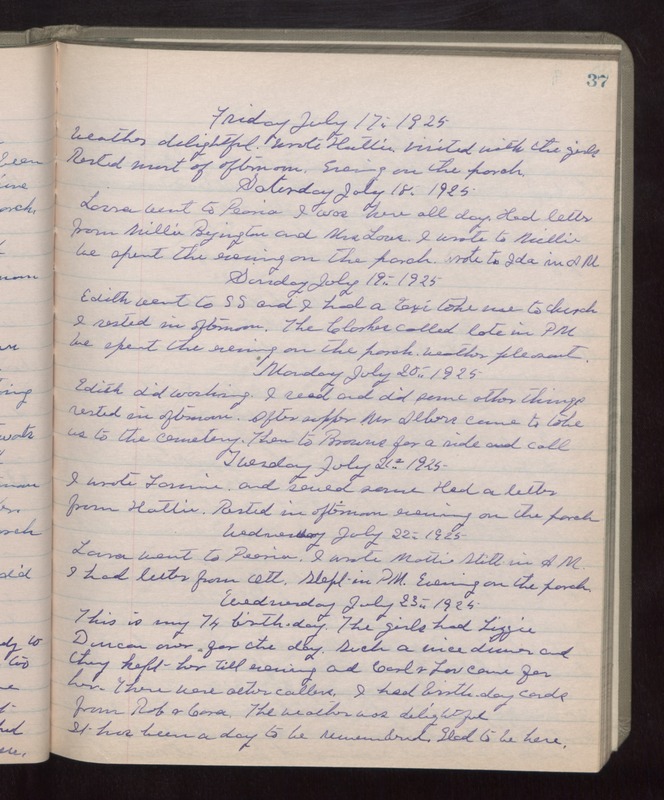 Tuesday July 21st 1925 I wrote Fannie and sewed some. Had a letter from Hattie. Rested in afternoon. Evening on the porch. Wednesday July 22nd 1925 Laura went to Peoria. I wrote Mattie Stitt in AM. I had letter from Ott. Slept in PM. Evening on the porch. Wednesday July 23rd 1925 This is my 74 birthday. The girls had Lizzie Duncan over for the day. Such a nice dinner and they kept her till evening and Carl & Lou came for her. There were other callers. I had birthday cards from Rob & Cora. The weather delightful. It has been a day to be remembered. Glad to be here.